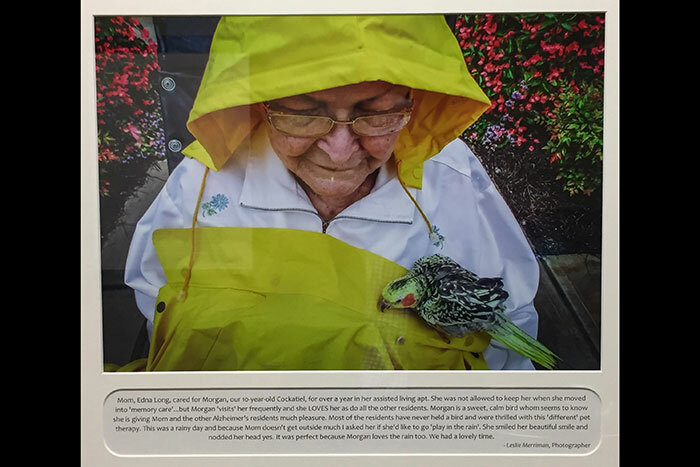 Photo of Edna Long with her cockatiel, Morgan, taken by her daughter and caregiver, Leslie Merriman. Click here to enlarge image. 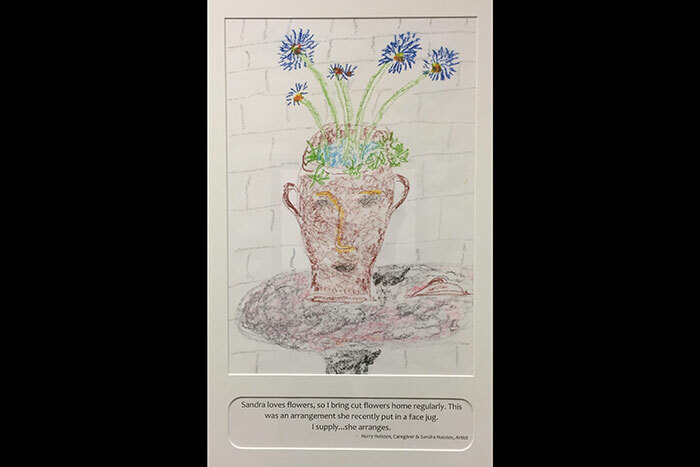 Drawing of flowers in a jug, by Sandra Haisten. Caregiver: Harry Haisten. Click here to enlarge image. Painting by Allenstine D. Willis. Caregiver: Monica Parker. Click here to enlarge image. 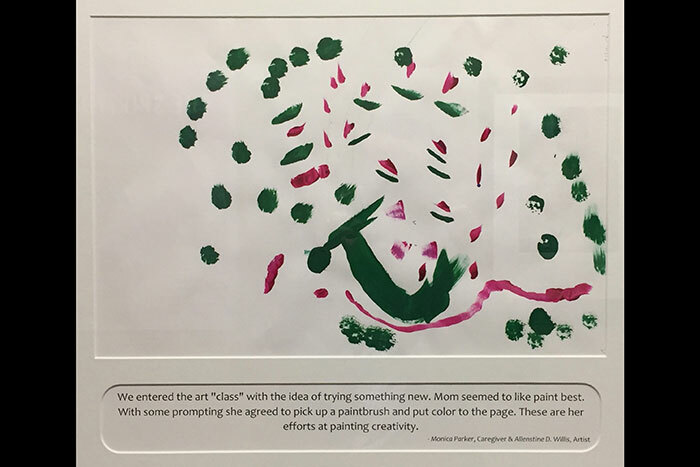 These three pieces of artwork from “The Spirit Lives On” permanent exhibit at the Woodruff Health Sciences Center Library were created by Alzheimer’s and dementia patients and their caregivers at art and photography workshops. Images courtesy Woodruff Health Sciences Center Library. 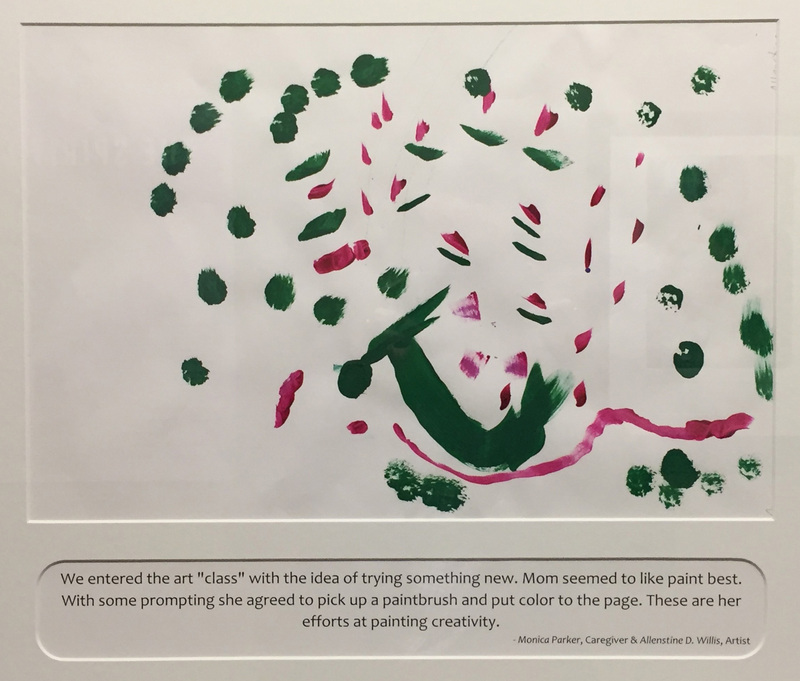 The Woodruff Health Sciences Center Library has opened “The Spirit Lives On: Art and the Mind,” a new dementia awareness permanent exhibit. 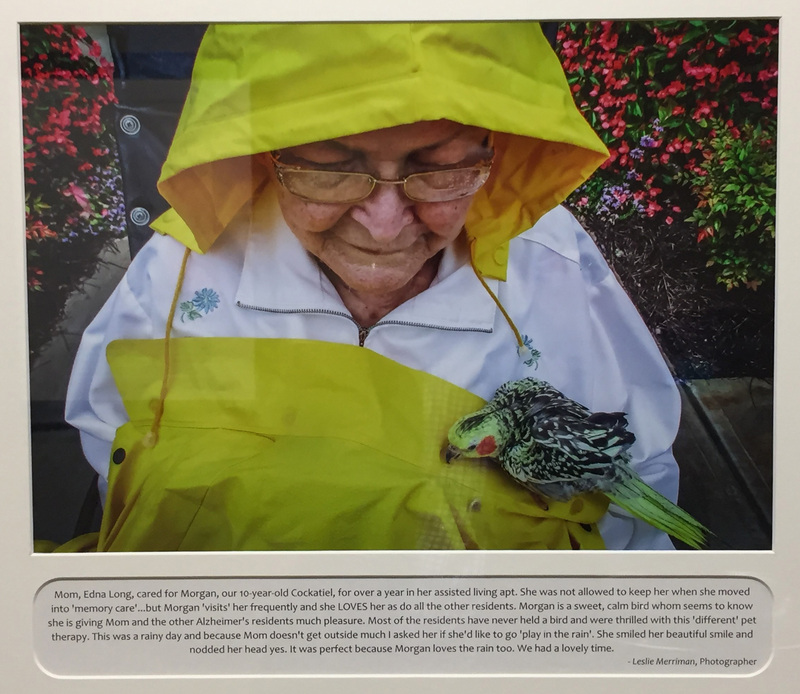 The exhibit documents some of the photography and artwork aspects of “The Spirit Lives On: Art, Music and the Mind,” which used the arts to highlight and acknowledge the impact of dementing illness on the lives of members of the Emory community. The three-part project, sponsored by the Emory University Alzheimer’s Disease Research Center and the Atlanta Master Chorale, took place between August 2015 and January 2016. The photography and painting portions of the project are displayed in this exhibit. “The Spirit Lives On” sought to increase the community’s awareness of issues facing persons living with a dementing illness and their caregivers, with an emphasis on the particular prominence of the illnesses in the African American community. The photography project was led by Thomas England, an Emory instructor and world-renowned photographer who has created portraits of presidents, famous musicians and numerous world leaders. It focused on dementia as a family disease and highlighted the family caregiving experience. Spouses and adult children of individuals with dementia received cameras and were invited to four workshops that provided instruction on producing digital images and storytelling through photography. Ten photographs by eight participants are displayed in this exhibit. 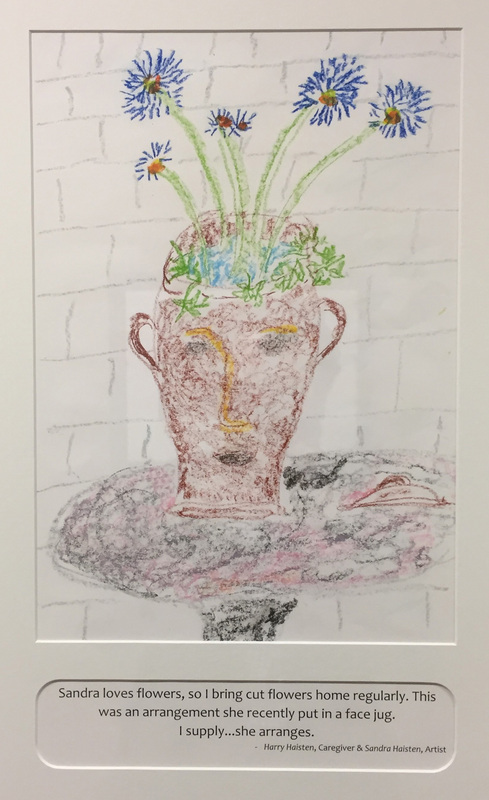 Edna Bacon, an experienced art therapist, potter and Carlos Museum docent, led four sessions with five dementia patients and their caregivers. The sessions began in the galleries of the Carlos Museum, focusing on two or three objects, and they ended in the museum’s Tate Room where participants reflected and created their own artwork based on the objects they observed. Eight pieces of artwork by eight participants are featured in this part of the exhibit. “The Spirit Lives On” exhibit is located on the lower level of the Woodruff Health Sciences Center Library and can be viewed during regular library hours.